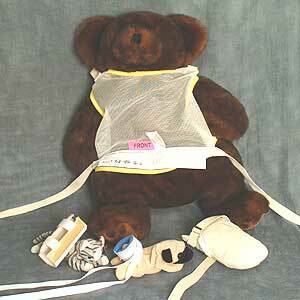 All personal items available in bariatric sizes. Split Side Rail Protectors are used to prevent patients from exiting the bed between the half side rails. This is accomplished by using a soft foam padding with a vinyl cover to fill any gaps between the two half side rails. Split side rail protectors are attached easily using hook and loop attachment straps. 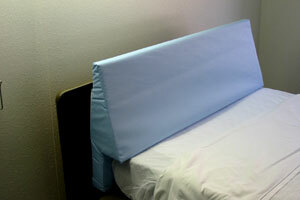 Soft foam core with blue vinyl cover helps to prevent side rail injuries and exiting the bed. Can be used to cover or close gaps between half side rails or can be zipped together, to cover entire length of the bed. Use six side rail wedge cushions for complete coverage. 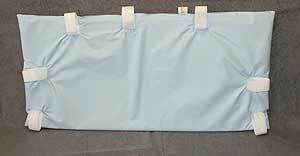 Hook and loop straps are used to attach cushion to the bed. The Pelvic Holder helps to position the patient upright and prevent sliding forward. It can be used in a wheelchair or Geri-chair. Quick release buckles can be added for easy attachment. EMAdamsCo.Com offers a complete line of children restraints: tie-back vests and criss-cross vests (S, M, L), disposable limb holders, fur limb holders, elbow splints, and mitts (infant, pediatric).